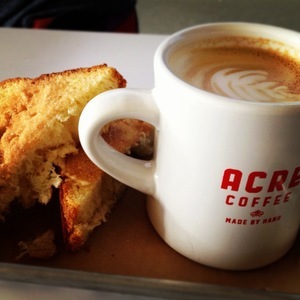 Toast and a latte from Acre. Photo courtesy Acre. Petaluma’s ~ACRE COFFEE~ has expanded into San Francisco with a location in the Public Utility Commission building in the Civic Center, providing workers and tourists in the area with a new option for Four Barrel coffee, breakfast, and lunch. For breakfast, look for granola and pastries, and for lunch, you’ll find sandwiches, salads, and soups that change seasonally. Take a look at the full lunch menu here. They’re open Mon-Fri 7am-4pm. 525 Golden Gate Ave. at Polk, 415-431-4421. FiDi sushi lunch spot ~SUSHIRRITO~ is getting ready to open their third downtown location. That’s right: MORE SUSHI BURRITOS. The new spot will take over the former Sawaii Sushi location on Kearny and will offer the same menu as the two current locations (Gi Paoletti Design Lab is also behind all of the locations’ look and design). They’ve got a beer and wine license this time around, too, so they’ll have a few additional beverage choices, including sake. There is still some permitting to get through, and they’re currently aiming for an early to mid-April opening. When they do open, their hours will be Mon-Thu 11am-4pm and Fri-Sat 11am-7pm. 226 Kearny St. at Sutter, 415-544-9868.